Dictation 13 1. ATM: automatic teller machine 2. cashiers desk 3. credit limit 4. deduct …from… … … 5. expiration date 6. one check or separate check 7. 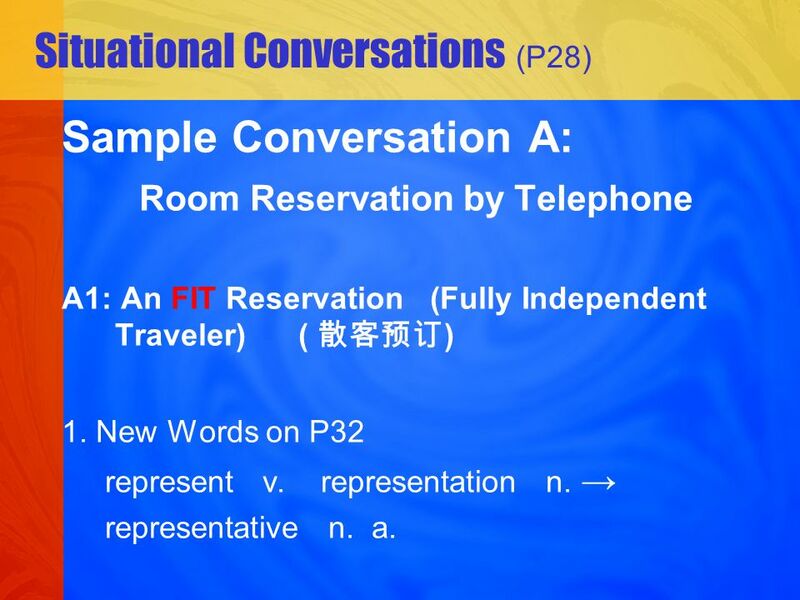 3 Situational Conversations (P28) Sample Conversation A: Room Reservation by Telephone A1: An FIT Reservation (Fully Independent Traveler) ( ) 1. 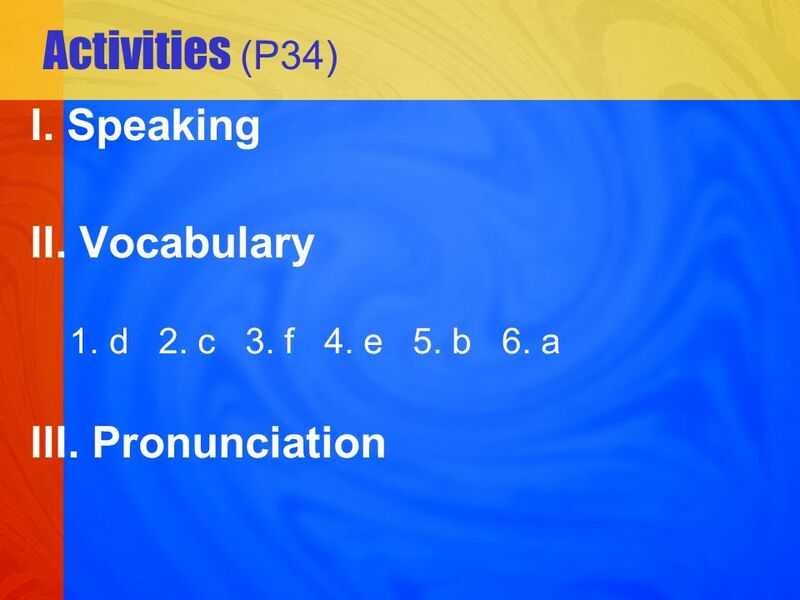 New Words on P32 represent v. representation n. representative n. a. 4 2. Please read Conversation A1 to see if you have any problems. 1) a double room 2) a double with bath/ shower / 3. Check your understanding. a. 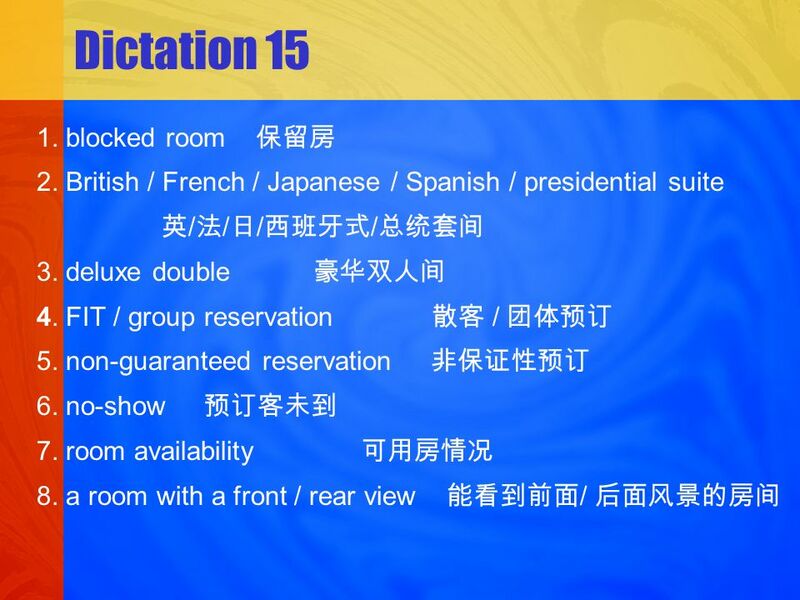 What kinds of double room can the hotel offer? b. 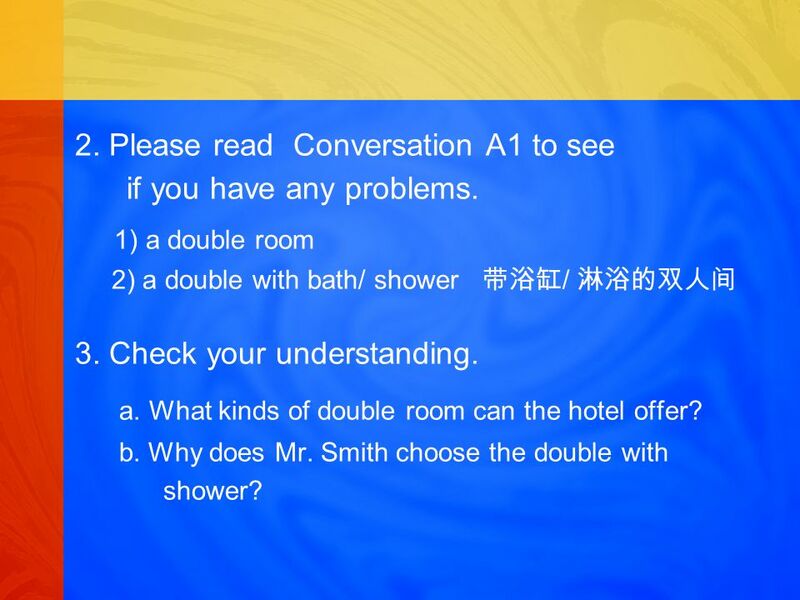 Why does Mr. Smith choose the double with shower? 7 1. New Words on P32 2. Please read Conversation B1 to see if you have any problems. 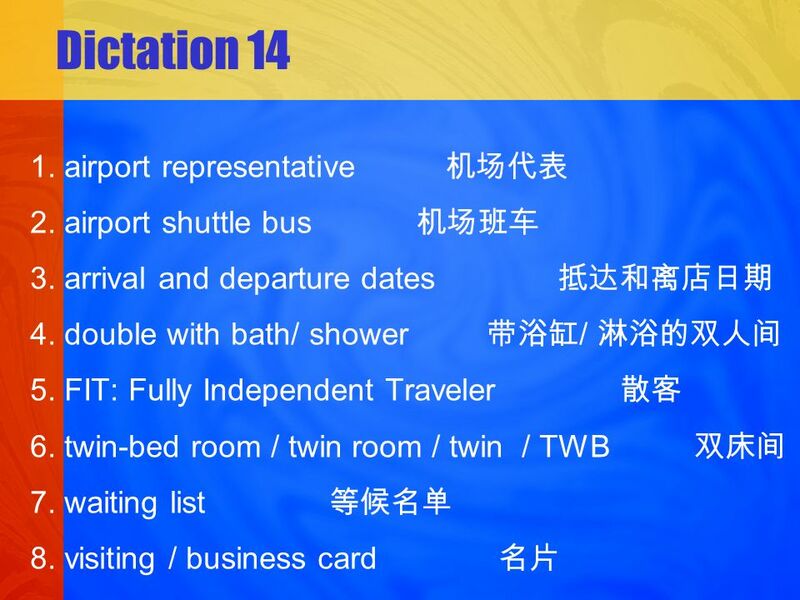 1) arrival and departure dates 2) …check in the computer… 3) waiting list 4) visiting card: business card (name card) 3. Check your understanding. For which dates will Mr. Williams need the room? 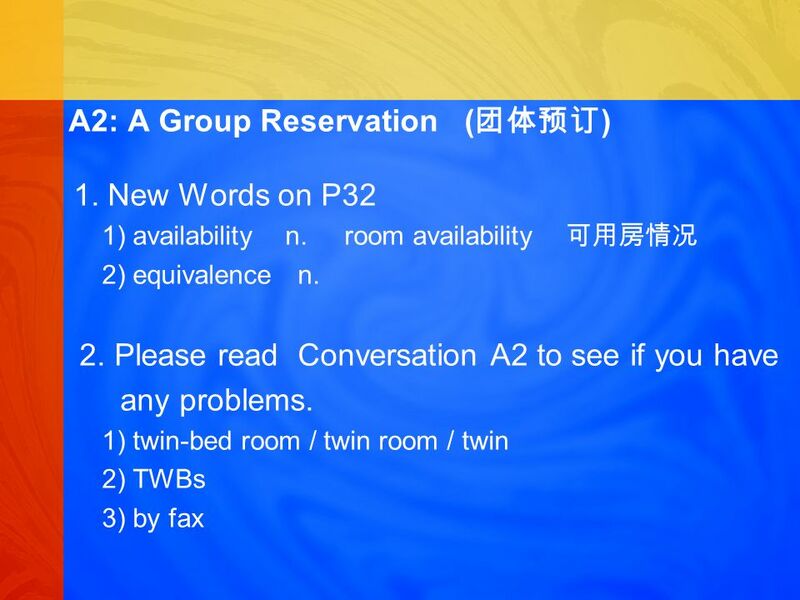 9 B2: We Have Rooms Available 1. New Words on P33 2. Please read Conversation B2 to see if you have any problems. a front view or a rear view 3. Check your understanding. 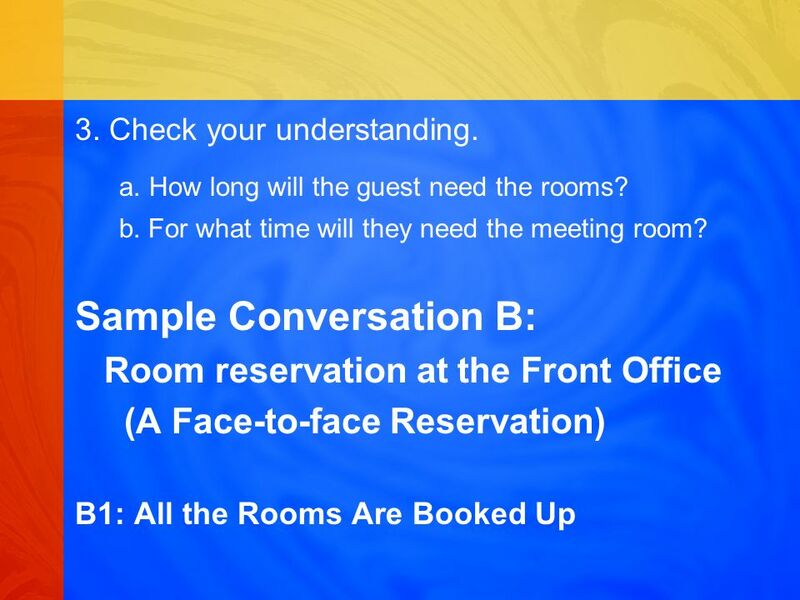 10 Sample Conversation C: Revising the Reservation 1. 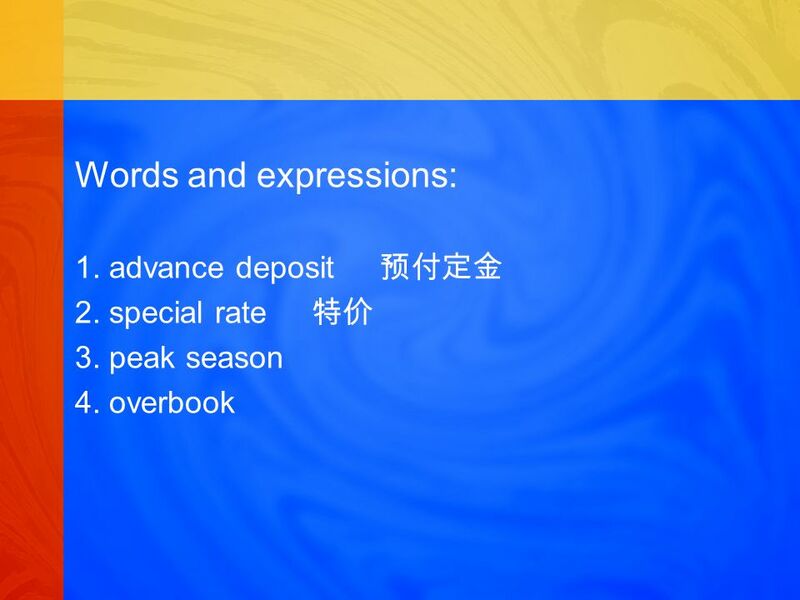 New Words on P33 1) revise v. revision n. 2) cancel v. cancelation n.
11 2. Please read the Conversation C to see if you have any problems. 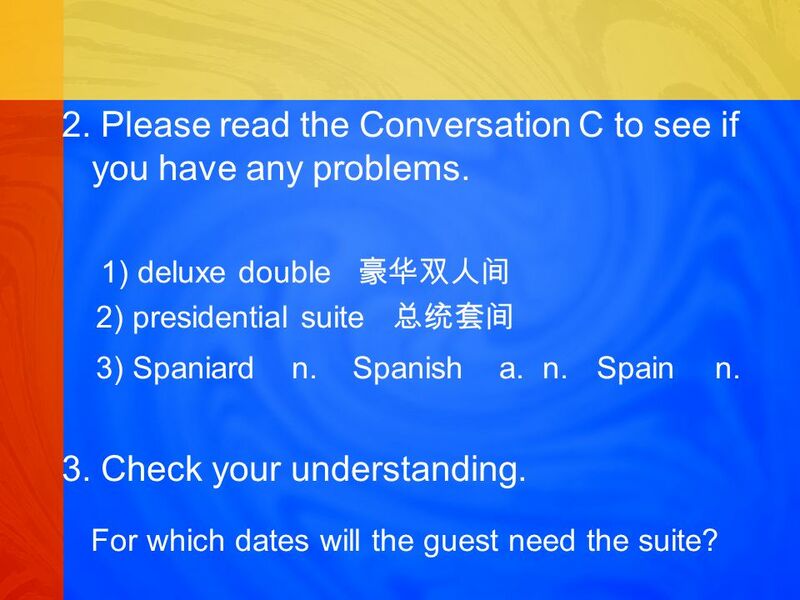 1) deluxe double 2) presidential suite 3) Spaniard n. Spanish a. n. Spain n. 3. Check your understanding. For which dates will the guest need the suite? 12 Sample Conversation D: No-shows 1. New Words on P33 2. Please read Conversation D to see if you have any problems. bill sb. sb. 13 3. Check your understanding. a. Why does the receptionist call the travel service? b. 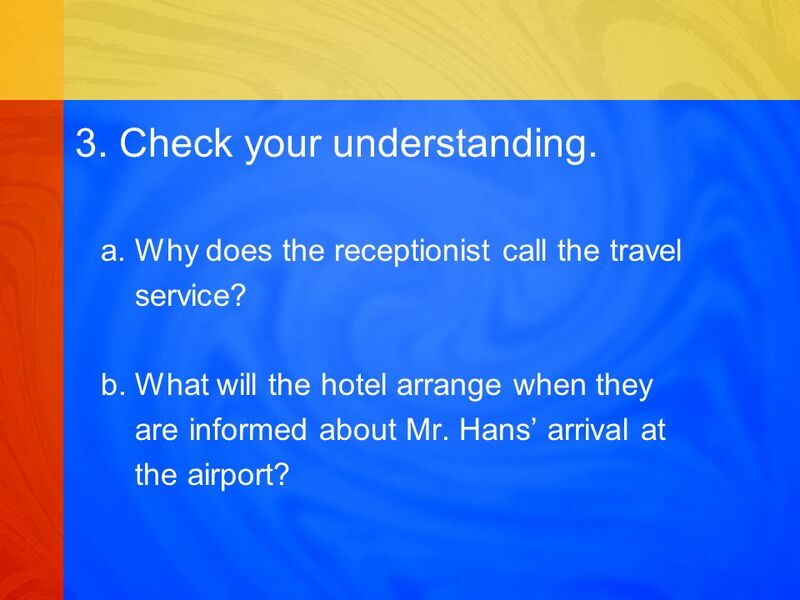 What will the hotel arrange when they are informed about Mr. Hans arrival at the airport? 18 IV. 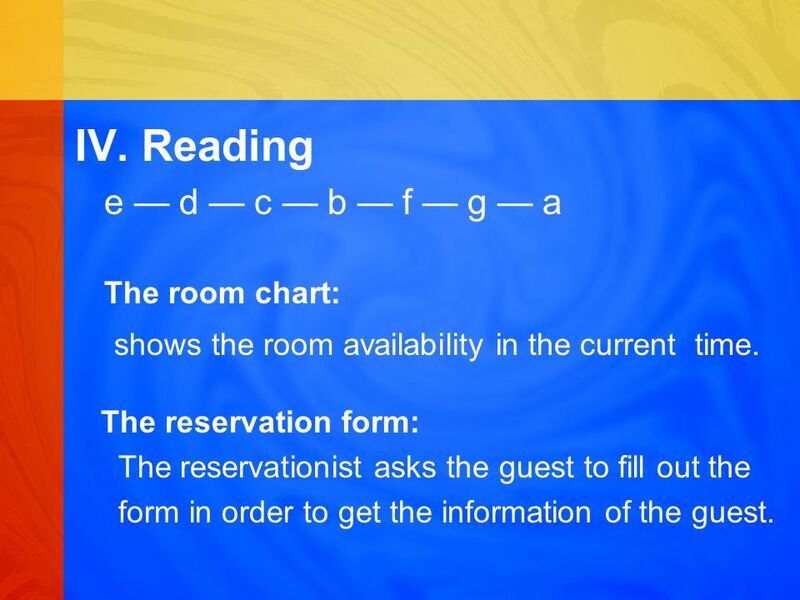 Reading e d c b f g a The room chart: shows the room availability in the current time. The reservation form: The reservationist asks the guest to fill out the form in order to get the information of the guest. 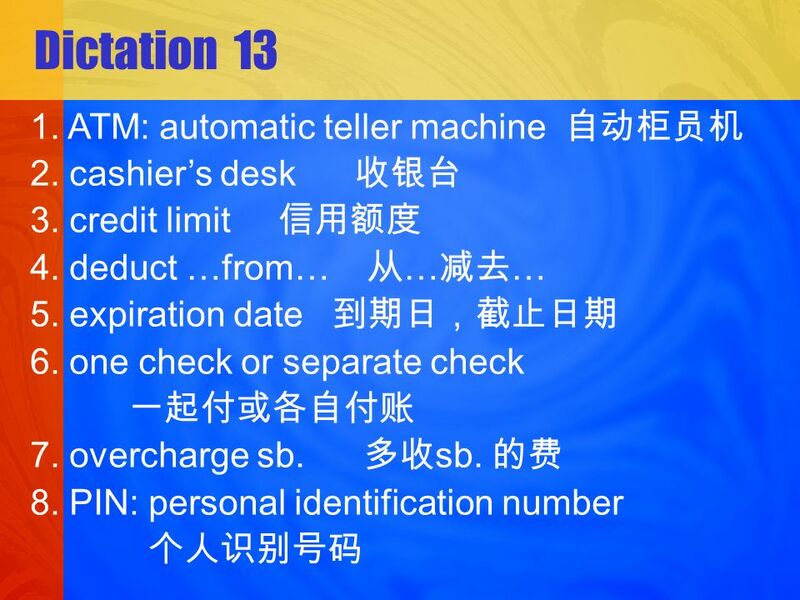 Download ppt "Dictation 13 1. ATM: automatic teller machine 2. cashiers desk 3. credit limit 4. deduct …from… … … 5. expiration date 6. one check or separate check 7." Dictation bell service / 2. Chief / Head Concierge 3. Concierge / Bell counter 4. contact number ( ) 5. country / area code / 6. health facilities. 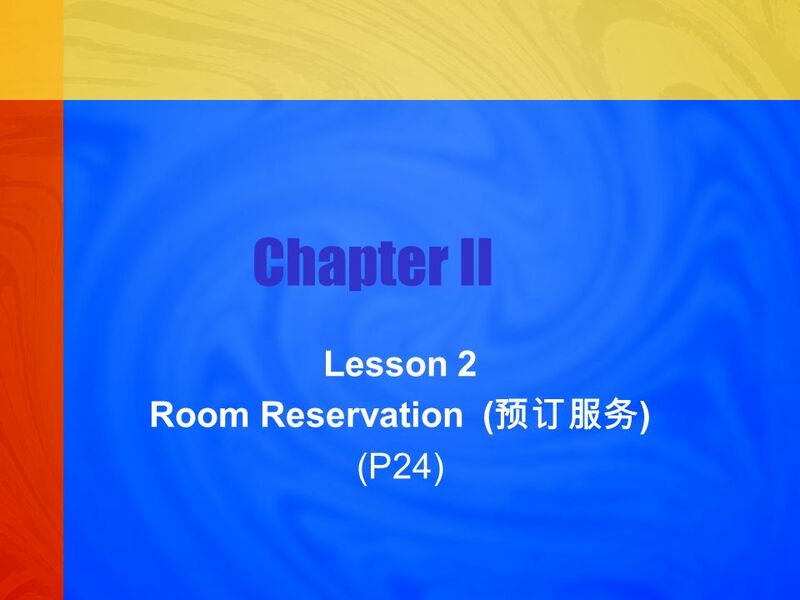 1 General Education Office IHM.316 / ILA2401 English for the Hotel Business Unit 4: Reservations and Check-In. Receptionist Reception Arrival at the hotel Elevator. 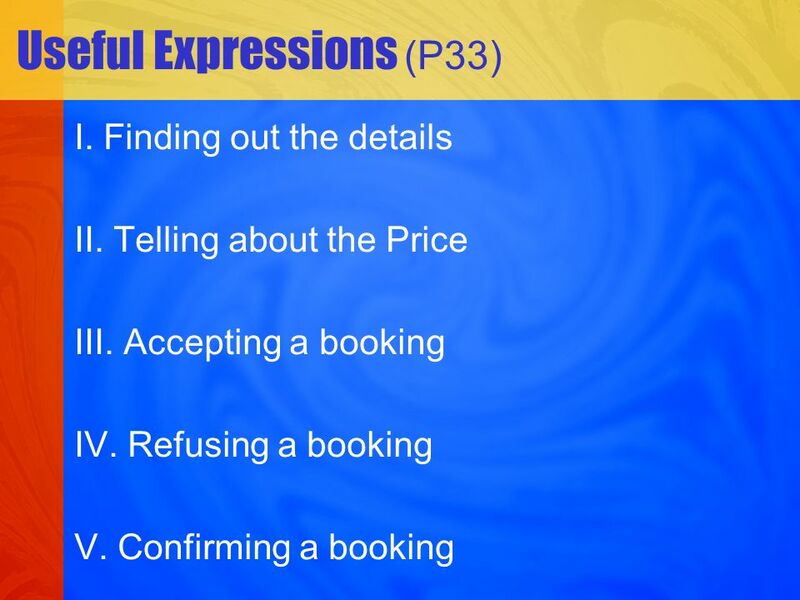 Tourism English UNIT5 Part I Lecture Time Assigned PARTMODULESCONTENTS STUDIEDPERIODS I Booking Train Ticket Train 1 II Booking Flight Ticket airline1. Short term offer for 1room apartment in Old Riga Price from 70 EURO per 24h * discount starting from 1 week. Hotel in your hand BookReset Hotel In Your Hand Enter maximum price of room/night in GBP Type of room No of rooms Check in Date Check out Date Results. hotel Front desk Meeting room gym Guest room.